Discover peaceful apartment home living in Charlotte, North Carolina at The Park at Steele Creek. Offering spacious one, two, and three bedroom apartment homes with a variety of well-appointed floor plans, The Park at Steele Creek will surely have an apartment that is right for you! Set on professionally-maintained, landscaped grounds, our pet-friendly community is also convenient, located just minutes from I-485, I-77, and the McDowell Nature Preserve. In addition, we are located near Olympic High School, Lake Wylie Elementary, and Southwest Middle School. Come enjoy our sparkling pool, fitness center, grilling area, playground, and tennis court. 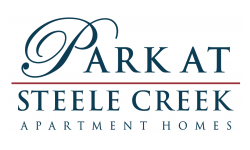 Visit The Park at Steele Creek Apartment Homes in Charlotte, North Carolina today!